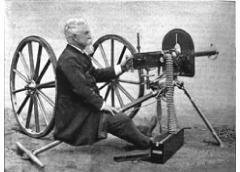 The first automatic machine gun was invented by Hiram S. Maxim in 1884. 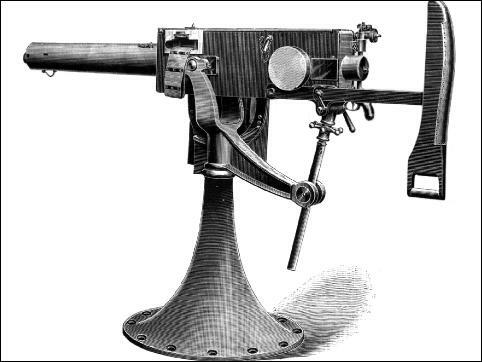 Prior to Maxim’s invention, machine guns were operated by hand – either by turning a crank or a lever. In Maxim’s gun the operations of loading, cocking, firing, withdrawing the empty cartridge from the barrel and ejecting it are performed by the recoil energy resulting from the explosion of the cartridge. 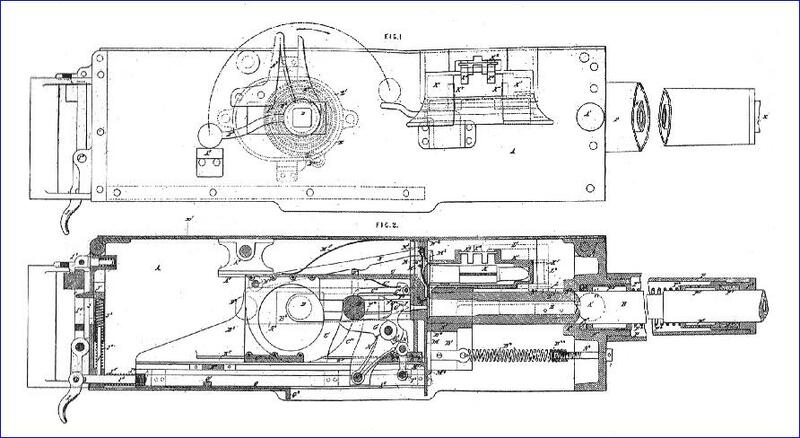 The evolution of the automatic machine gun from his first prototype to the more familiar ‘world standard’ gun of 1888 are covered in these pages. It is my intention to expand these pages with descriptions of the mechanism of Browning and Lewis guns, but those will have to wait until my animations of Maxim's designs have been completed. 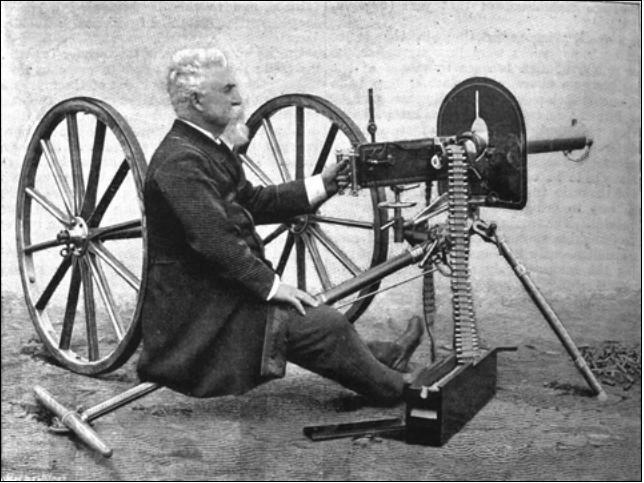 The mitrailleuse or machine gun, as constructed before Maxim’s invention, was a weapon in which all the functions of loading, cocking, firing, and extracting the empty shell from the gun were performed by turning a crank or by working a lever. The first successful gun of this kind was the invention of Dr. Gatling, an American. This gun was brought out during the war of the American rebellion, and before metallic cartridges, which are so essential to the success of a machine gun, had reached the necessary degree of perfection. Dr. Gatling did not succeed in getting his gun used to any extent in the great American war. 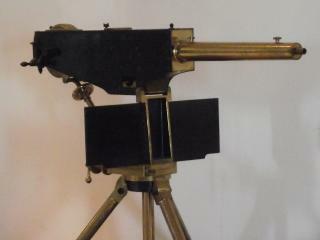 The first machine gun which ever saw service in the field was the French Reffye mitrailleuse [link]. This gun was large, absurd, and clumsy, and so heavy that it required to be drawn by horses; it would fire but 150 shots per minute. It did not comprise the necessary elements of success, and consequently failed. The next machine guns to make their appearance were the Hotchkiss, the Lowell, the Nordenfelt, and the Gardner. All of these, except the Nordenfelt, were operated by a hand crank, the Nordenfelt alone being actuated by a reciprocating lever. All of these guns must necessarily be mounted upon a firm base, and be trained and elevated by screws and worm gears. If they were made to work freely upon a pivot or universal joint, they would not be firm enough to remain stationary while the crank or handle was being operated. The safe speed at which a machine gun can be fired depends in a great measure upon the kind and age of cartridges used. For instance, if cartridges have been made some time a trifling amount of moisture may have accumulated in the powder near the primer. When this dampness occurs they may not explode at the instant of being struck, that is the cartridges are said to hang fire. Suppose that one cartridge in a thousand should hang fire, it would be necessary to operate the gun sufficiently slowly on the entire series, to give this slow cartridge time to explode, otherwise it might be drawn from the barrel before it exploded, or in the act of exploding, in either of which cases it would disable the gun. To this may be attributed a great deal of the trouble in operating machine guns, and their liability to get out of order when most needed. In the gun described in the linked page and which is the invention of Mr. Hiram S. Maxim, of 57a, Hatton Garden, London, slow cartridges do not offer an obstacle to the rapid firing of those which will explode quickly, from the fact that no cartridge can be drawn from the gun until it has exploded, as it requires the force of its own explosion to unlock the block from the barrel and extract the empty shell. In Mr. Maxim's new gun there is but one barrel, and all the functions of loading, cocking, firing, withdrawing the empty shell from the barrel, and ejecting it, are performed by the recoil resulting from the explosion. 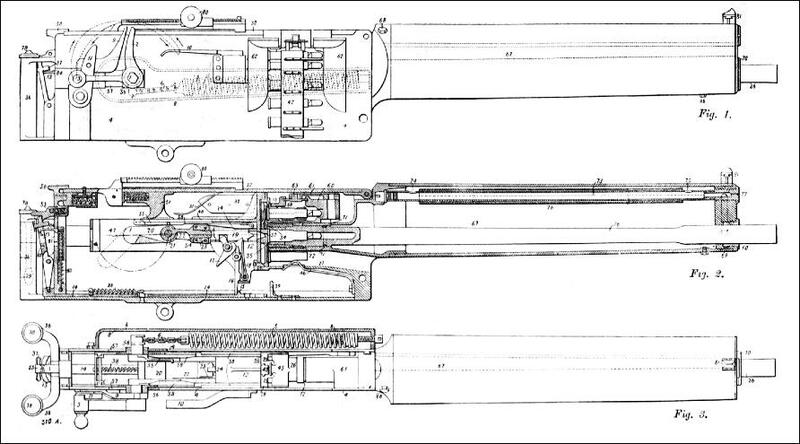 This gun may be likened to a small engine, the barrel under the influence of the recoil acting as the piston, the block as the crosshead, and the sear and trigger as the valve gear. 333 cartridges are placed side by side in a canvas belt, secured together with brass eyelets and strips. One end of this belt is fed into the mechanism, and the gun is operated by hand until the first cartridge is driven into the barrel. Then the trigger is pulled, this cartridge explodes, the breech bolt is unlocked from the barrel, the empty case is extracted, moved to one side, a loaded cartridge is brought in front of the barrel, the arm is cocked, the cartridge pushed home and the trigger pulled, when the explosion of the second cartridge operates the same as the first. Thus the firing may be kept up automatically without any action on the part of the attendant as long as there are any cartridges in the belt. The paragraphs below are 'placeholders' for animation and descriptive web pages yet to come. Maxim was not satisfied with his initial prototype - it was too expensive to make, and he further refined it in his patent 1307 of January 1885 [Mx7]. In this new design, he did away with the second feed wheel. and refined the design so that it could be made very light and of great strength, and if desired, be made so that it could be very readily taken to pieces and put together again. Between 1887 and 1889, Maxim perfected his design, which he referred to as the world standard design, since it had been sold to many countries, and for a wide range of cartridge sizes. The 37-millimetre, or 1.457-in. Maxim gun is chiefly used as a naval weapon, its weight, as compared to the rifle-calibre gun, being against its use in the field. Some, however, have been sold for land purposes; in fact, it is a very light gun for its power, the weight being 3 cwt. 2 qr. 24 lb. It is also sometimes fitted so as to be used for landing purposes. Note that the nickname Pom-Pom was first used by the natives during the Boer Wars when the gun was used very effectively on a land carriage.